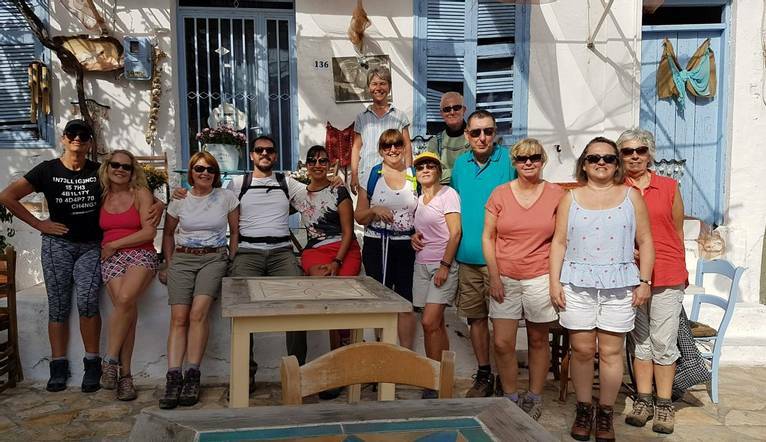 Join us for a week’s relaxed walking, and some wonderful Greek hospitality on the beautiful island of Zakynthos – one of Greece’s greenest and sunniest islands. Triangular in shape, beautiful Zakynthos has 3 distinct geographical areas: the north west is mountainous with quaint traditional mountain villages, the central region is a fertile plain rich with olive groves and vineyards and the south east is characterised by stunning beaches. Our walk starts along the beautiful Blue Flagged beach at Tsilivi, before heading inland to Bochali. Here the locals gather in the Square to see and be seen, a perfect spot to have a rest and enjoy the impressive view over the capital below. Continuing to Zakynthos Town, we take a stroll through this elegant Venetian-styled town with its maze of narrow streets, buzzing boulevards before heading back via Lofos Strani Park, where the Greek National Anthem was composed. This hike is a beautiful route over narrow paved lanes through lemon groves and vineyards. In the distance we can see the spire of the small Ano Gerakari church, proudly built on top of a hill. The path meanders uphill, where we eventually we arrive at Saint Nikolas church, rewarded with an amazing view. We transfer to the Keri peninsula, on the south east of the island for a spectacular walk starting at high limestone cliffs dropping down in the dark blue waters of the Ionian Sea. The trail meanders over goat herder tracks and we’ll pass a hidden grove with the oldest olive trees of the island before we reach the small harbour of the village of Limni Keri. This beautiful walk takes us through the hidden valley of Loucha. Our hike starts at the village café where you could try a local favourite, a chilled coffee (extra charge), before we stroll through fields of wildflowers where the scents of thyme, oregano and aniseed dominate the air. Hopefully (dependent on the season) we’ll meet a beekeeper and taste his honey straight from the hive. We’ll enjoy spectacular views over the entire island as we continue, ending up at a traditional taverna where the owner makes his own wine, and we can celebrate the end of a glorious week with a glass of his wares. Cheers – or as the Greeks say, Yiamas! I thought the Tour Leader was exceptionally helpful and kind. The walks and guides were extremely interesting and amusing. I felt like I really knew and understood the history of the island by the time I left. Our small, simple and friendly family owned property is ideally located in a quiet corner of Alykanas, surrounded by pine and olive trees and just minutes from the sandy beach. There are a number of bars, restaurants, convenience shops and a supermarket all located close by. Facilities include a private outdoor swimming pool with loungers and umbrellas and new for 2019 there will be a poolside changing room with toilet and shower. Breakfast and lounge area, honesty bar and common outdoor gardens complete this lovely property. Our pleasant rooms feature Air Conditioning (payable locally) a kitchenette with fridge and safety deposit box. The sleeping area is equipped with an LCD TV and a private balcony furnished with a small table and chairs. Shower rooms are being upgraded for 2019. A number of hairdryers are available to hire (with an additional charge, payable locally) Free Wi-Fi is available throughout. The transfer time from Zakynthos Airport to our hotel is approximately 30 minutes. Below are the distances for each walk, however please bear in mind these are approximate and subject to change due to local conditions. All of the walks are relatively flat, however we have highlighted the maximum ascent and descent where applicable. It is important that you have the correct footwear. It is essential to wear walking boots that are comfortable and preferably lightweight, with some ankle support and a good grip. If you already have a pair of boots that you are happy walking in (including during hot/wet weather and on hard ground), then bring these along. However, if you are bringing new footwear, do make sure they are well broken in before you arrive. There will be plenty for you to see and do during your own leisure time during the course of your holiday, full details of which will be given out at your Information Meeting by your Tour Leader. Please note that prices shown may vary according to numbers. Full details will be given at your Information Meeting. All tours must be paid for in euros only. Your Tour Leader will help arrange these for you and explain where you will need to go but may not necessarily accompany you. We suggest a Group Collection to cover transfer drivers, and hotel staff of €20 per person. Your Tour Leader will collect this on your behalf and distribute it accordingly, thus relieving you of the burden of who, when and how much to tip. The tipping of housekeeping will be left to your individual discretion (a small amount left in your room on departure should cover this and would be much appreciated). As is customary, ‘the hat’ will be passed around for the driver and guide on all optional excursions. For any meals that are not included in your itinerary, or taxi fares, your Tour Leader can advise of an appropriate % to add on.